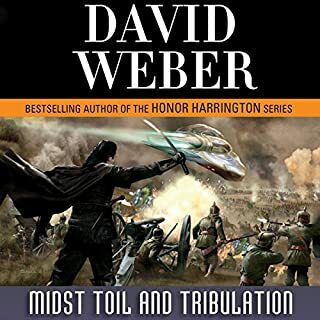 First, I want to say that I'm a Weber fan, having read this series, the most of the Honor Harrington series, the Prince Roger series, and even some of his more obscure stuff. I know Weber has a tendency to ramble on, but the action scenes have always made it up for me. 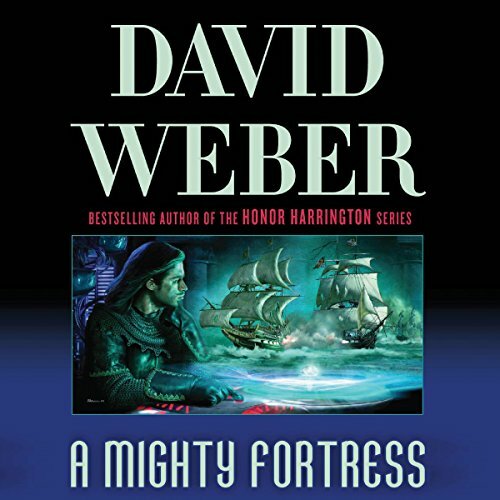 Unfortunately, Mighty Fortress was very disappointing and finally pushed me over the edge. What do I mean? 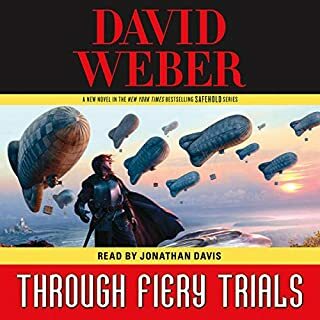 There are several things that always annoy me about Weber's books and Mighty Fortress has them in spades. 1. There is at least 20:1 ratio of meaningless conversation to exciting action scene. During the conversations, the story progresses at a snails pace, if at all. 2. Those meaningless conversations are made that much more painful by the NON-STOP use of the phases "to be honest", "truth to tell", etc. Once you notice this, it will drive you CRAZY. 3. 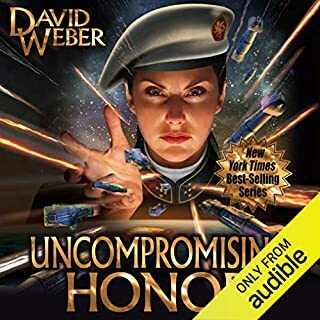 You will note that there are really only two, maybe three characters in Weber's books: 1) rational good guy; 2) rational bad guy, who would be a good guy if their honor, patriotism, faith did not force them to the wrong side; and 3) irrational bad guy. How do you differentiate them? The first two character types are really the same, using the phase "to be honest" often, they're just on different sides. The third type, the irrational bad guy will not use the "to be honest" phrase and will often be irrational to an unbelievable degree. If you've read the rest of the series, let's face it, you'll probably read this one also. If you decide to boycott the book, great! If enough people do so, maybe Weber will "be honest with himself" and realize that he owes us a better sequel. I don't customarily write reviews, but I feel compelled to do so this time. This is far, far below Weber's normally outstanding work. The characters spend way more time thinking, and far less time doing. The action scenes are pretty much non-existent. 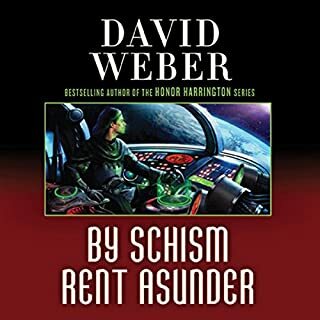 I'm not drawn in by the political side of Weber's works, but they are usually well balanced by scenes that move the plot forward or provide for some intense action. I can't remember more than about an hour of action within the entire 35+ hours. In the end, this book is NOT worth the 2 credits. My recommendation is to hold off on picking this book up until/if the next book in the series arrives and you can see if that one improves. If the next book is better, you might just want to find an abridged version of this one or read a plot summary. 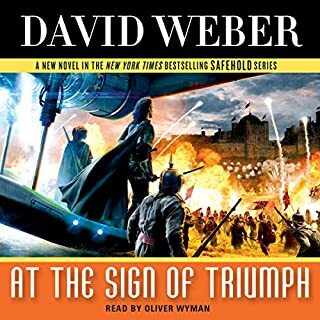 I really, really wanted to like this book, as I have been enjoying the series so far, and I like David Weber's work. This book felt cobbled together from bursts of writing to an outline. Very repetitive descriptions, multiple times, of events from previous books (a simple prologue would be cleaner). A tiresome amount of weepy sentimentality over casualties in the warfare segment. Way too many characters with dialogue for exposition rather than action. When the action finally, finally happens... in the last 30 minutes... it is sketched over hastily with the emphasis on how tragic it all is. Also, irritating amounts of errors in the sea battles where the Charisian ships are referred to as Doloran. Really, it felt like the editors were in Tahiti on this one. A third of a book stretched out to 3 books length. Almost nothing at all happens in this book for very long times. It really looks like Weber has been deliberately stretching out the sentences and scenes only to make the book longer. Most of the very, very, elaborate descriptions of scenes and ponderings add almost nothing to the story as a whole. I was slightly put off by the fact that this book was 2 credits instead of the regular one credit but decided to get it anyway because I previously enjoyed the authors work very much. I regret to have to write that this book wasn't worth the 2 credits I payed by a long shot. Weber lost me with this one. 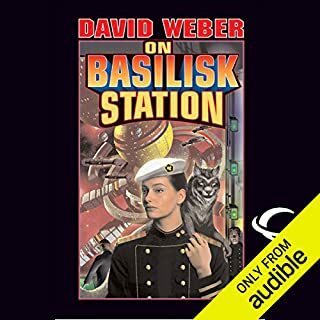 Even in as passive a format as an audiobook, this one is difficult to take. 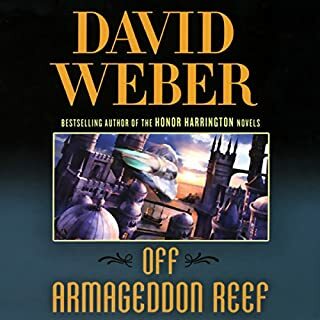 Weber's rapidly expanding list of characters waste your time in an endless series of meetings and discussions, during which they often take breaks for personal reflections. 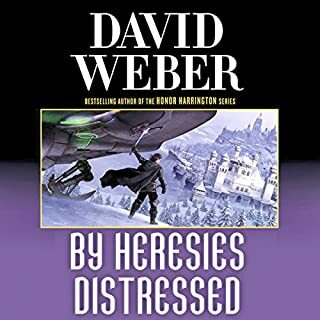 In previous novels Weber would liberally intercut similar scenes with action, often featuring his protagonist Merlin/Nimue (who incidentally, is re-introduced to us again in the fourth volume, at length). 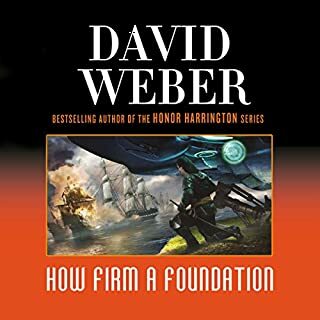 This time around, we mostly just get the talking, much of which attempts to gracefully boost Weber's own political and religious views. For those fans who weren't aware, he's a fiscal conservative, a strong 2nd amendment supporter (and I'm generally on board with him, there) as well as a lay minister in a more liberal Protestant denomination. In the last of these he lays out the common plea of liberal religionists, that both skepticism of religious belief and fierce adherence to dogma are both destructive of human happiness in their suspension of the mystery of spirituality. Just so happens that no character engages the former cause and only the bad guys engage the latter. Subtle, huh? But even that would have been forgivable if the action of the book didn't plod along at such a glacial pace. 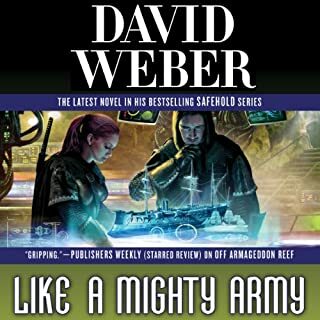 Readers familiar with the series may recall the first novel, filled with battles, assassination attempts, tragic deaths and self-sacrifice--that's in short supply here, and it's why I won't return to Safehold. I'm sad that it had to be this way. Wow... best one so far! Took me a while to get used to Culp's characterizations... but I like them now. They feel natural. With so many bad reviews complaining that this one is slow and plodding, I was expecting to be disappointed. Instead, I find this one the best book so far. 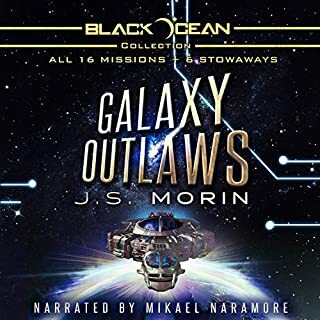 Perhaps all those bad reviewers were looking for more of an action novel, but the depth of intrigue and complex interdependencies make this one *very* engaging. If you're truly a Safe Hold series fan you've got to listen to this or get the bloody book! It's worth the time and effort. 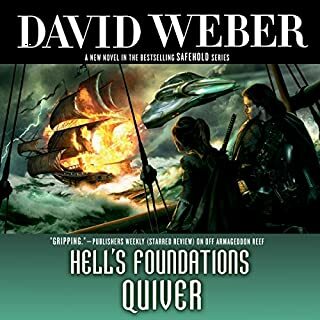 Weber is a masterful story teller of war on the open seas, besides an intriguing storyline of political back stabbing and underhandedness. You'll never regret starting this series that's for sure. Excellent story, as expected. I ignored the world around me as it unfolded. Good job. incredible performance of an incredible story. this series is great. Weber captures the imagination and emotions of the readers. historical basis to the story are awesome. At least half of this book is focused with minute and boring detail on the Temple Lands. I miss Oliver Wyman's performance. Just crank the play speed to 2x through non-Merlin chapters or skip them altogether. You will get the summary when the main characters talk about what happens. I enjoyed how this series started and I like the premise, but right now it is a mind numbing trudge through story lines that hold zero interest to me.